We’ve been hearing quite a bit about upcoming Motorola devices: just yesterday we talked about the existence of a Moto X4, which signaled a return to the flagship that preceded the Moto Z line of last year. Now, a new leaked image by the reputable Evan Blass shows a number of Moto devices coming in 2017, covering just about every category. Furthermoe, the Moto X4 returns in this leak, once again confirming the new design language and some of the devices’ features. The picture itself is quite descriptive and self-explanatory: the Moto family has now grown to 5 letters, with the Z seemingly residing at the top of the hierarchy through its “unlimited capabilities”. The Moto Z Play and Z Force are shown by themselves without a regular Moto Z, as the Z Play seems to be filling that gap. The slide doesn’t tell us much other than the fact that motomods will return, though the mentioning of “gigabit LTE” points straight at an upgraded Snapdragon 835 processor, which was expected anyway. Below the Moto Z Play and Moto Z Force we find the upcoming Moto X4, under the label “unlimited perfection”. The new Moto X will go back to basics with a smaller 5.2 inch FHD display, a 3D glass design and “smart cam” features. 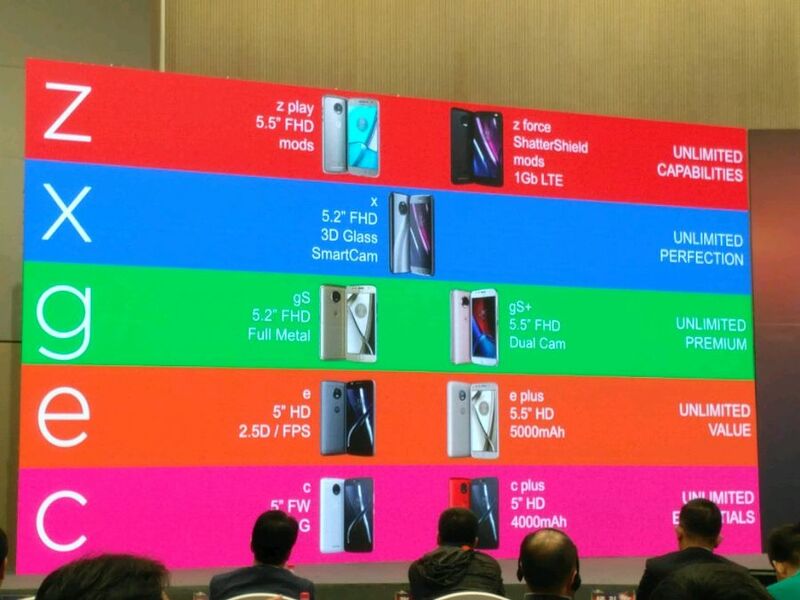 While the picture isn’t clear, it does confirm recent leaks, indicating that the phone will sport a glass design not unlike what’s being adopted by other popular flagships. The entries in the Moto G (a new Moto G5“S”, according to Evan Blass), E and C also look to be excellent value propositions, with big batteries and a refined design language. All of this points towards an exciting year for Motorola, with an expansion of its traditional categories. Under Lenovo, the company has come pretty far and deviated from the simpler ‘X,G,E” lineups it used to offer. It might be a bit more confusing and crowded, but these do look like solid offers and quite a barrage of products to storm this last half of 2017. What do you think about the new Moto devices and the categories they will be coming in? Let us know your thoughts below!